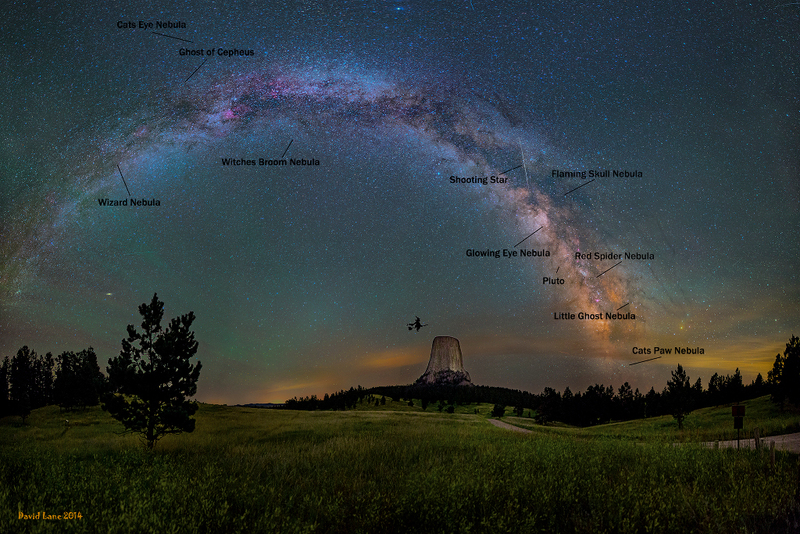 Explanation: A mysterious formation known as Devils Tower rises into the dark above northeastern Wyoming's prairie landscape in this 16 frame panoramic view. Seen against the night sky's thin, pale clouds and eerie green airglow, star clusters and nebulae of the Milky Way arc toward the galaxy's central realm at right. Of course the scene contains the Milky Way's own haunting and grisly visages of halloween, including ghosts, a flaming skull, a glowing eye and a witch's broom. To find them, slide your cursor over the picture or just follow this link, if you dare. And have a safe and Happy Halloween!